Patients with Parkinson’s disease show a gait disturbance which is considered as one of the most disabling aspect of the disease that strongly impacts on patients’ autonomy and quality of life. The mechanism underlying gait impairment is multi-factorial, reflects the global motor impairment of patients with PD and is mainly related to a neurotransmitter deficiency inducing bradykinesia, rigidity, abnormal trunk control and postural instability. For this reason, and considering the impact of social and economic costs, one of the main foci of intervention in patients with PD should be treating gait abnormalities. This need is further reinforced by the knowledge that gait outcomes are correlated with longevity, cognitive decline and adverse events. Besides the shorten-step gait clinical description of the gait disorder in PD, in the last years, studies using modern 3D motion analysis systems have further detailed the gait pattern in PD disclosing abnormalities in cadence, stance duration, swing duration, double support duration, leg length, step length, velocity, hip, knee and ankle ROMs. Such abnormal gait parameters seem to correlate with the clinical outcomes of UPDRS score, H-Y stage and milliequivalents of levodopa taken. Importantly, gait parameters can either normalize or improve after several rehabilitative treatment strategies including physiotherapy, assistive equipment, sensory cueing, treadmill training, physical activity, home base exercises. However, none of the previous studies specifically investigated which biomechanical factor can be modified after rehabilitation and which clinical characteristic can predict the rehabilitation-induced gait improvement. This would be extremely important to typifying, grouping and selecting patients, optimizing the rehabilitative strategies and cost management. The aims of the present study were to evaluate in a sample of patients with PD: i) which gait parameters can be modified after a short-term rehabilitation program; ii) which, if any, clinical variable can predict the improvement of the gait function after rehabilitation. At this aim we quantitatively evaluated the gait performance of PD patients by means of a 3-D motion analysis system. Fifty out of 67 patients with idiopathic PD assessed for eligibility were recruited at Rehabilitation Unit of Department of Medical and Surgical Sciences and Biotechnologies, University of Rome, Sapienza, and at Rehabilitation Unit of Policlinico Italia Centre, Rome, Italy. Patients were admitted for outpatient rehabilitation between May 2014 and April 2017. The inclusion criteria were a diagnosis of idiopathic PD according to UK bank criteria (Hughes et al.,1984) and Hoehn and Yahr stages 1 to 3. All patients were in a stable drug program and had adapted to their current medications for at least 2 weeks. Exclusion criteria were: cognitive deficits (defined as scores of 17 on the Beck Depression Inventory [BDI]), and orthopedic and other gait-influencing diseases such as arthrosis or total hip joint replacement. All participants could walk independently without walking devices. All patients were taking oral administrations of levodopa (18 patients), dopamine agonists (5 patients), or both (13 patients) and were recorded in on phase. Patients’ clinical and anthropometric characteristics are shown in Table 1. Severity of parkinsonism was evaluated using the Unified Parkinson’s Disease Rating Scale (UPDRS-II and III) and the Hoehn and Yahr staging system. The study complied with the Helsinki Declaration and received local ethics committee approval Prior to taking part in the study, all the participants gave a written consent after a fully explanation of the experimental procedure. This is a bi-centric, observational, before-after rehabilitation study with blind observer (see figure 1 for flow-chart). Both clinical (neurological visit and scale administration) and instrumental (gait analysis) evaluations were carried out 2 times: at baseline before rehabilitative treatment and at 10- week after rehabilitative treatment (final evaluation) (Figure 1). Medication was kept constant throughout the trial, and all interventions were performed at the same time of day for each patient during ON phase. Participants were asked to maintain their pre-enrollment activity level and current medication dosage when not in the laboratory. Assessors, for both clinical and instrumental evaluations, were blinded to the time of the assessment. The rehabilitative program comprised 60-minute sessions a day (3d/wk). Participants within the program were encouraged to progress, based on stated progression criteria to ensure adequate level of challenge across all sessions for all participants, the exercise program was conducted in the clinical setting only - without supplemental practice of the exercises at home. Gait analysis was performed using an optoelectronic motion analysis system (SMART-DX 500 System, BTS, Milan, Italy). It consisted of eight infrared cameras (a sample frequency of 300 Hz) used to detect the movement of 22 passive spherical markers covered with an aluminum powder reflective material (15 mm in diameter) placed over prominent bony landmarks, in accordance with a validated biomechanical model. A calibration procedure was executed before the first data capture was performed. Spatial accuracy was 0.2 mm in the x, y, and z dimensions. A global reference system was adopted in accordance with the International Society of Biomechanics. Before formal measurement were taken, anthropometric measurements were obtained for each subject according to Winter’s method. Patients were asked to walk barefoot at a comfortable, self-selected speed along a walkway approximately 12 m in length while looking forward. Controls were requested to walk both at their preferred speed and at a lower speed. Owing to the interest of this study in natural locomotion, only general, qualitative instructions were provided. Before the recording session, subjects practiced for a few minutes to familiarize themselves with the procedure. At least six trials were recorded for each patient and session. To avoid muscle fatigue, each trial was separated by a one-minute rest period. Three-dimensional (3-D) marker trajectories were recorded using a frame-by-frame acquisition system (SMART Capture - BTS, Milan, Italy) and labeled using a frame-by-frame tracking system (SMART Tracker - BTS, Milan, Italy). Marker position data were interpolated and low-pass filtered using a zero-lag fourth-order Butterworth filter (6 Hz), and analyzed using 3-D reconstruction software (SMART Analyzer, BTS, Milan, Italy) and MATLAB software (MATLAB 7.4.0, MathWorks, Natick, MA, USA). For each patient, we rejected the first walking trial and considered the subsequent 5 trials. To ensure that the gait parameters were captured during steady state walking, the first and last 2 steps of each trial, which correspond to the acceleration and deceleration phases, respectively, were excluded from the analysis. Hence, we considered for the analysis only the central two steps of the affected and unaffected side for each trial, corresponding to approximately 20 steps (on average) for each subject at each session. Assuming that speed was slower in patients, in order to avoid the potential velocity bias, the gait speed was matched between groups as follows: for each control group subject, we considered only those trials in which the gait speed value fell within the range identified by the patients’ mean gait speed ± SD for both baseline and 10-week evaluations. The following time parameters were calculated for each subject and session: stance duration (time interval between two consecutive foot strikes of the same lower limb) expressed as a percentage of the stride duration. The following spatial parameters were computed for all the enrolled subjects at each session: step length (m) and step width (m). Furthermore, walking speed (km/h) and cadence (number of steps/min) were calculated for each subject and session. A priori power analysis using the G*Power computer program indicated that a total sample of 32 participants would be needed to detect large effects (d=0.8) with 80% power using a paired t test between means with α=0.05. According to this formula, for each gait parameter, patients were considered as improved if the values were closer to the control ones, either positive or negative, otherwise were considered as unchanged or worsened. The Shapiro-Wilk test for normal distribution was preliminarily executed. Student T test or Mann-Whitney were used to compare gait parameters between patients and controls. Paired t-test or Wilcoxon test was used to detect any significant differences in the clinical and gait parameters between baseline and 10-week evaluation. Cohen’s d was employed as a measure of size effect, with small (d=0.2), medium (d=0.5) and large (d=0.8) effects. Side-dependent gait measures (e.g. step length, hip joint ROM, etc.) were separately analyzed and compared according to the affected or more affected side (A) and not affected or less affected side (NA). Chi-square test was used for categorical variables to compare the number of patients improved and the number of patients either unchanged or worsened. Pearson or Spearman bivariate correlation tests were used to evaluate the association between clinical and gait variables. Multiple linear regression analysis with backward selection was performed to evaluate the predictive value of each variables at baseline on the gait variables improvements at final evaluation. Significance was set at p < 0.05 for 2-sided tests, and all analyses were performed using SPSS 20.0 (IBM). Of the 50 recruited patients, 14 patients were not included in the study, as they could not be contacted any more (2), undergone drug modification (4), failed to complete T1 due to transportation problems (3), had medical complications (4) or did refuse to continue the rehabilitation program (1). A total of 36 patients (72%) (16 F, 20 M, mean age 68.8±9.8 yrs, range age 42-80 yrs) completed the 10-week evaluation (Figure 1, Table 1). No significant differences were found between patients and controls in terms of age, gender, height and weight (all, p>0.05). No patients changed neither the pharmacological treatment nor the H-Y stage at the 10-week evaluation compared to the baseline evaluation. We found a significant decrease in the UPDRS-III score at 10-week (t=3.701, p<0.001) (Table 1). In particular, the UPDRS-III score decreased by 2.04 points at 10-week evaluation. No significant differences were found in UPDRS-II and UDPRS II+III scores between baseline and 10-week evaluation (p>0.05). At baseline evaluation, almost all gait parameters, but step width, trunk flexion-extension and bending ROMs, were significantly different compared to those of controls; all with large (d=0.8) size effects (Table 2-2.1). In detail, patients with PD showed lower values of gait speed than controls (0.77 m/s vs 0.99 m/s, p<0.05) and, at matched speed, lower values of step length in both sides, cadence, hip joint ROM, trunk rotation ROM, and higher values of stance and temporal asymmetry index than controls. Changes in gait variables between baseline and 10-week evaluations are reported in Figures 2. Significant lower values of stance duration, on both affected (z=-2.713, p=0.007), and unaffected sides (z=-2.440, p=0.015) and spatial asymmetry index (z=-2.325, p=0.020) were found at 10-week evaluation than at the baseline. Moreover, higher values of cadence (t=-2.180, p=0.036), speed (t=-3.089, p<0.001), hip joint ROM, in both affected (t=-2.848, p=0.007) and unaffected (t=-3.020, p=0.005) sides, trunk rotation ROM (z=-2.985, p=0.003), and step length, in both affected (t=-3.309, p=0.002) and unaffected (t=-2.271, p=0.029) sides, were found at 10-week evaluation compared to baseline. At Chi-square test, for each gait parameter, we found a significant higher number of patients who improved (all > 64%) compared to those who did not (Table 3). Figure 2. This figure shows the independent-side time-distance parameters, trunk kinematic and asymmetry indexes at baseline and at 10-weeks follow-up. Bar heights represent the mean and the error bars the standard deviation of each variable. The asterisks denote statistical significant differences. Note: flex-ext=flexion-extension; RoM= Range of Motion; T0=baseline; T1= 10-weeks follow-up. Figure 3. This figure illustrates the side-dependent time-distance parameters and hip joint kinematic at baseline and at 10-weeks follow-up. Bar heights represent the mean and the error bars the standard deviation of each variable. The asterisks denote statistical significant differences. Note: A= most affected/affected side; flex-ext=flexion-extension; NA= less affected/unaffected side; RoM= Range of Motion. Note: A=most affected/affected side; NA= less affected/unaffected side; RoM= Range of Motion. The results relative to the multiple linear regression models. In detail, UPDRS-III, gender, disease duration, total LED and its baseline value predicted the step length in the affected side, while the same variables, but the total LED, predicted the step length in the not affected side. H-Y stage, gender and its baseline value predicted gait speed. Gender and its baseline value predicted cadence. Age and gender predicted asymmetry spatial index. Total LED and its baseline value predicted hip joint ROM-A. Total LED, H-Y stage, height and its baseline value predicted trunk rotation ROM. This study was aimed at individuating which gait parameters, if any, could improve after rehabilitation and whether there are clinical factors that can predict the rehabilitation-induced gait function improvement. The main findings can be summarize as follows: i) almost all gait parameters improve after 10-week rehabilitation program; ii) the gait parameters improvement can be predicted by a set of clinical variables including UPDR-III score, gender, height, disease duration, total LED, H-Y stage. Compared to the controls, at baseline evaluation, we found a significant reduced gait speed (0.77 m/s vs 0.99 m/s). Since most of the gait parameters are speed-dependent, in this study we have matched the gait speed for both the evaluations. This procedure further improves our understanding about which are the most relevant impaired gait parameters and which are the most susceptible to the changes induced by the physiotherapy without the gait speed as confounding bias. At matched speed, almost all the gait parameters, but step width and trunk flexion-extension and bending ROMs, were significant different from those of the control group (Table 2-2.1). Although, many of the previous studies did not match for the gait speed, our findings are in line with previous reports and confirm that patients with both early and advanced PD show a relevant gait impairment compared to the healthy subjects. After 10-week rehabilitation program we found an improvement of all those gait parameters that were impaired at baseline, with the exception of the temporal asymmetry index (Figures 2-2.1,3). This finding indicates that the gait parameters, that are impaired at the baseline, are susceptible to be improved by the rehabilitation. Such improvement involved an high rate of patients (>64% for each gait parameter) and, interestingly, leaded to a complete normalization of some them, e.g. spatial asymmetry index and trunk rotation ROM (Table 2-2.1). These findings can help us to better focus the rehabilitation strategies on some aspects of the gait function. As regard the multiple regression analysis findings, we found that the delta values of the gait parameters showed a causal association with their baseline values combined with a set of clinical parameters including UPDRS-III, H-Y. gender, disease duration, height, total LED. Interestingly, we did not find bivariate correlation between the clinical and gait variables, indicating that not a single but a set of clinical variables can predict the gait function improvement. In detail, taken altogether the results from the multiple regression analysis, suggest that male PD patients, in early stage, with mild disease’s severity, short disease duration and higher LED values are more susceptible to improve their gait parameters after a short-term (10 weeks) rehabilitation program. Another interesting result is that the trunk rotation ROM, which normalizes after rehabilitation, is predicted by the patients’ height and total LED. Thus, the lower the patient, the higher the trunk ROM improvement after physiotherapy. Al these findings could allow us to increase our ability of grouping patients according to their clinical characteristics with the common aim of better focus the rehabilitative programs for those groups of patients who are more prone to improve after rehabilitation. At the same time we must to better targeting our efforts in finding new rehabilitative strategies for those patients who are less susceptible to improve after rehabilitation. For instance, other than for the disease staging, the rehabilitative treatment should be differentiated according to the disease severity, disease duration, age, height and gender. Particular attention should be paid in the rehabilitation of the trunk trying to differentiate the rehabilitative strategies in taller compare to shorter in height patients. Also the pharmacological treatment could be modified according to the potential improvement expected after rehabilitation. Further multi-center studies in a large sample of patients with PD are needed to better associate the motor improvement induced by the rehabilitation to the specific rehabilitative techniques. In conclusion, our data may be useful to better focus rehabilitative treatment, mainly by grouping patients and personalize the rehabilitation according to the functional status. Interestingly, the H-Y stage was not the only predictor in term of gait function improvement. This is noteworthy, because the current rehabilitation guidelines are mainly planned according to the H-Y staging system. Corso di Laurea in Medicina e Chirurgia, Facoltà di Farmacia e Medicina - Università degli Studi di Roma “Sapienza". Meunier S, Pol S, Houeto JL, Vidailhet M. Abnormal reciprocal inhibition between antagonist muscles in Parkinson’s disease. Brain J Neurol 2000; 123: 1017-26. Pau M, Corona F, Pili R, et al. Effects of physical rehabilitation integrated with rhythmic auditory stimulation on spatio-temporal and kinematic parameters of gait in Parkinson's disease. Front Neurol 2016;7: 126. doi: 10.3389/fneur.2016.00126. eCollection 2016. 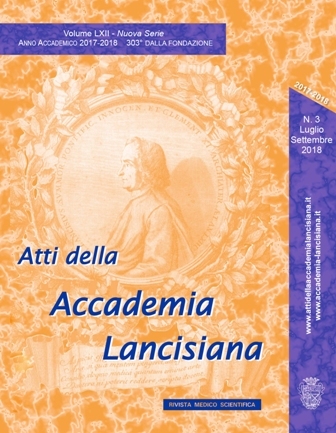 Pistacchi M, Gioulis M, Sanson F, et al. Gait analysis and clinical correlations in early Parkinson's disease. Funct Neurol 2017; 32: 28-34. Keus SHJ, PT, Munneke M, Nijkrake MJ, Kwakkel G, Bloem BR. Physical therapy in Parkinson’s disease: evolution and future challenges. Movement Disorders 2009; 24: 1-14. Vieregge P, Stolze H, Klein C, Heberlein I. Gait quantitation in Parkinson's disease-locomotor disability and correlation to clinical rating scales. J Neural Transm 1997; 104: 237-48.